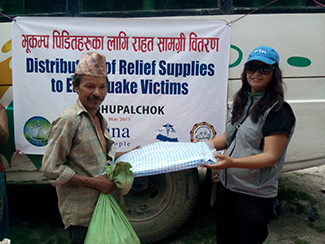 The Nepali NGO NEST World has already delivered tents, food, medicine and clothes for 109 families (more than 400 people), with funds donated by Humana (8.996 €). The families are from Ghatt donada Unichaur, Dyamside, Jolunge, Banshagu, Lamsanghu and Thauthal villages of Sindhupalchok district. The humanitarian needs have increased after the second major earthquake that struck the country, of 7.4 degrees, occurred last Tuesday. NEST volunteers are working with Healthcare Access Nepal, which is providing tents and food. You have full information on NEST's work on its website.